Rockstar Juiced Energy Drink is an energy drink and juice hybrid formulation with 50% juice. The version manufactured for The UK, New Zealand, and Australia has less caffeine at 151mg/ 473ml can. Rockstar Juiced is also additionally sweetened with Sucralose. But, so far I've seen 3 versions on the shelves here in New Zealand; Original, Juiced, and Sugar Free although on their Australian website they list Punched Versions and Energy Water as well. Besides the can I picked up to write this review, I've chosen this drink several times and I would have to say so far it is my favorite New Zealand energy drink in the limited line-up. I think Rockstar has got this just right. I've had many of the "Juiced" varieties over the years and many are too sweet or the taste of the sucralose really comes through at the end. This drink has a nice, easy to drink tropical flavor with a light carbonation. 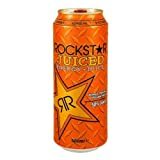 Rockstar Juiced has 50% fruit juice along with the usual energy ingredients and the caffeine content clocking in at 151mg. These drinks have been reformulated for the Southern hemisphere market as a 16oz Rockstar in the USA would be at 160mg. This drink does have some sucralose as a sweetener, but thank God I couldn't taste it. I was struggling to stay awake on a Monday, late morning even after having my two cups of coffee so I was happy to review this drink with hopes it would wake me up for my afternoon. It didn't disappoint, but it didn't make me wired and I still could have forced myself to take a nap unlike barely preventing one before. Carbonated water, fruit juice concentrates (a blend of apple, pear, mango, orange, and passion fruit juice from concentrates), glucose, taurine, citric acid, taurine, natural flavors, sodium benzoate (to protect taste), ascorbic acid, caffeine, potassium sorbate (to protect taste), L-carnitine, inositol, milk thistle extract, ester gum, ginko biloba leaf extract, sucralose, guarana seed extract, niacinamide, calcium pantothenate, panax ginseng root extract, riboflavin, pyridoxine hydrochloride, beta-carotene (color), cyanocobalamin. Sugar content: 63 grams (per 16 ounces). How Does Rockstar Juiced Compare? 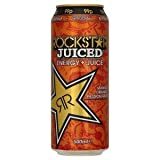 Rockstar Juiced contains 10.00 mgs of caffeine per fluid ounce (33.81mg/100 ml). From the Rockstar website (http://www.rockstarenergy.com/) ingredients page.